The Crook County Cowboys have been struggling to get people to soccer practice. Some have been injured, others have still been working summer jobs, while still others have missing paperwork or other requirements for eligibility. The end result is that the team was forced to play short-handed on Thursday in their opening match of the season. The results weren't pretty as the host Madras White Buffalos cruised to a 9-1 victory. "More teamwork and communication was needed in this game because today most of my varsity team did not show up," first-year head coach Nestor Covarrubias said. "I played with half varsity and half JV. I understand the difference between the two teams and the reason for the score." The Cowboys stayed in contention the entire first half. Madras took an early lead, but led just 2-0 as the first half neared its conclusion. 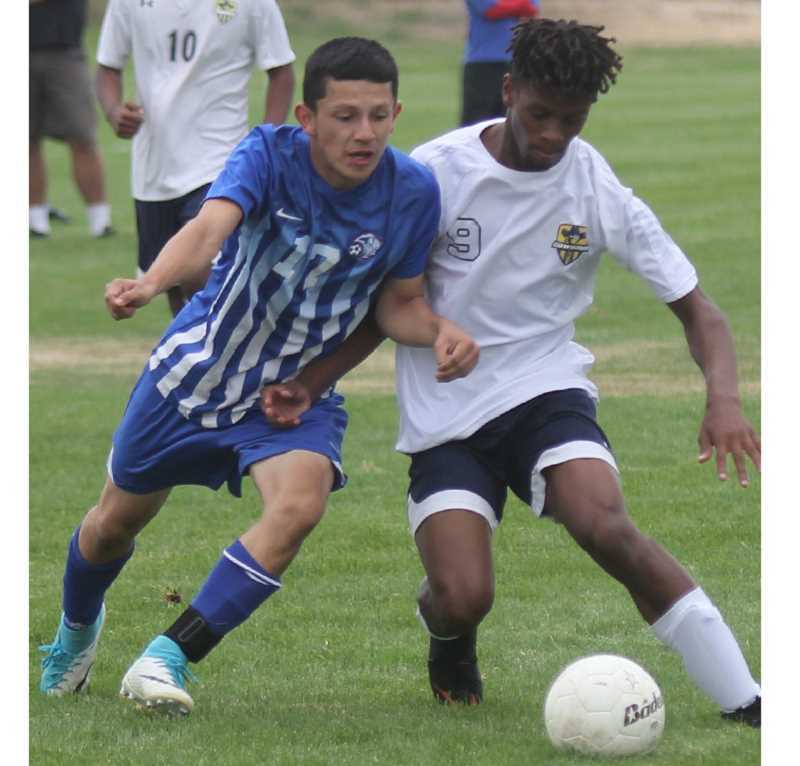 Then in extra time, just before the half ended, Crook County's Kevin Sanchez took the ball from midfield and raced alone all the way to the front of the Madras goal, where he placed a perfect shot into the bottom corner, making the score 2-1 at the half. The White Buffalos made some adjustments at halftime, and from that point on, it was all White Buffalos as Madras scored seven unanswered goals in the second half to pull away for the easy win. Covarrubias noted that not only have the Cowboys had trouble getting their entire roster to practice, the lack of practice time has been compounded by smoke. "Some of my guys have asthma and could not run outside because of smoke," he said. "We practiced two times indoor, and the team did not like it. I was having trouble getting kids to be at practice. Sometimes we had maybe only five or six players." Covarrubias added that Madras is a good and experienced team, while Crook County is very young. "The Madras team has been playing together for two or three years," he said. "They are pretty good. The team was sad because of the score, but I told them they need to understand we are not a full team yet, and we played a really good team. I told my team they did a good job because we only had two weeks practice, and that was with just half of my team." The White Buffalos are currently 2-0 on the season. Madras, which reached the Class 4A quarterfinals a year ago, is ranked fourth in the first coaches' poll of the season. Meanwhile, Crook County graduated much of their team a year ago, when they finished with a 3-8-1 record and were fifth out of six teams in the Tri-Valley Conference. The Cowboys return to action on Tuesday, Sept. 4, when they go on the road to take on The Dalles in the opening match of the Intermountain Conference season. Following Tuesday's match, the team does not play again until Thursday, Sept. 13, when they host Sandy in a 4:30 p.m. match.